There are still four days left in our UNICEF Auction for Action in ebay.ph. Please click on this logo and it’ll take you to the bidding site. You will see that the auction is going quite well but of course fundraising is never going to be enough. The more funds we raise, the more programs can be run for children in education, nutrition, safety, anti-trafficking and more. 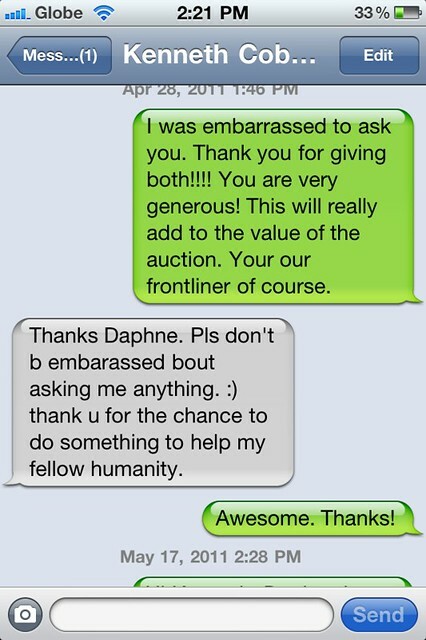 Kenneth Cobonpue was the first artist I asked when we planned this auction. 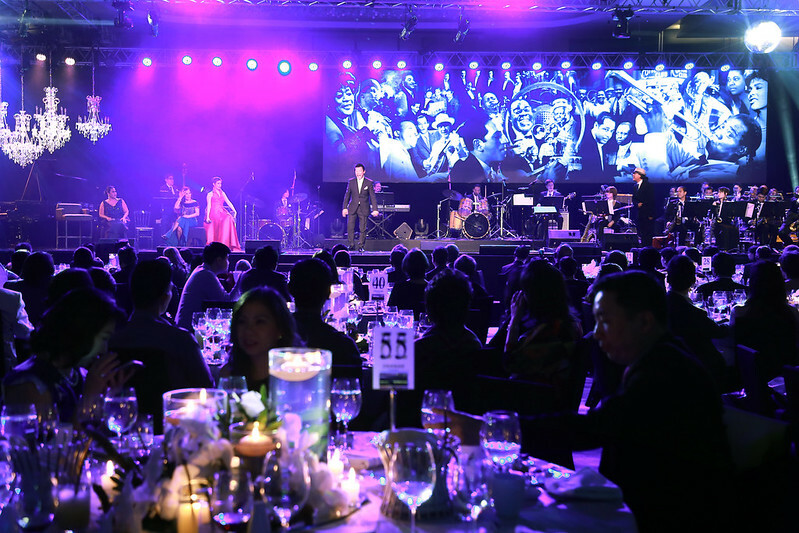 I wanted the auction to represent the best in Filipino design. And Kenneth tops the list. He donated two items, the Boomtown Lamp and the Harry rocking stool. Both are doing so well, I’m excited to see the outcome on Saturday. I think our site will be on fire then! So bid now. Grammar freak that I am… major mistake on my part there. Oops. I meant “you’re”. But anyway, isn’t he so nice? 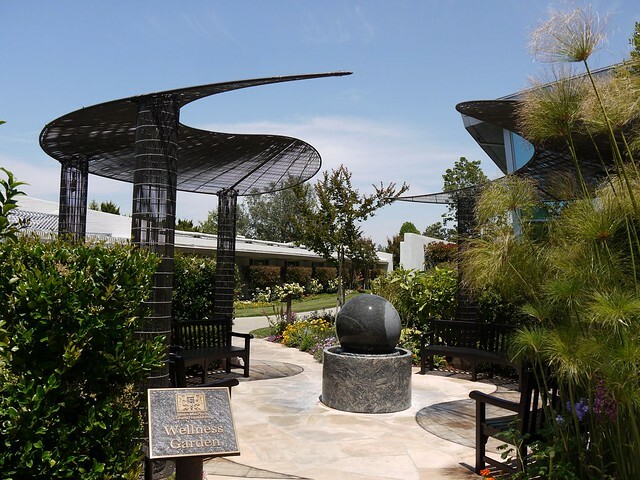 Just last week Kenneth’s new sculpture at the wellness garden of the Motion Picture and Television Fund in Hollywood was inaugurated. He told me about this last year while it was still in the works. 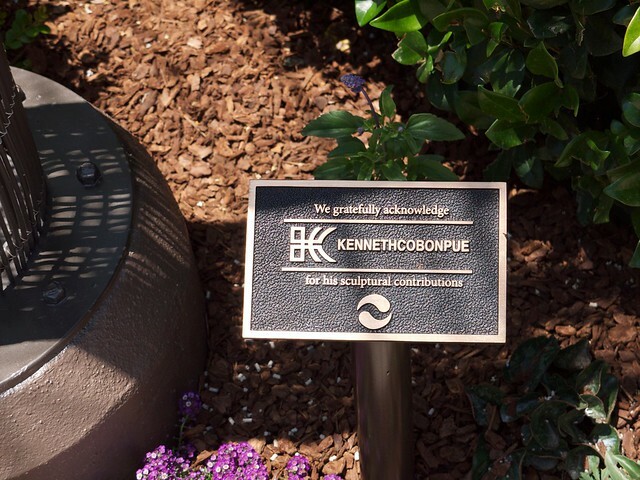 It looks great to see Kenneth’s work in a different context. I think we need public sculptures like this in Manila. For now the best news we have, Kenneth and his colleagues Royal Pineda and Budji Layug are working with the NAIA management on some cosmetic improvements. So there, yes I get noisy like that. Seriously though, where does the airport money go??? That’s P750 per traveller! 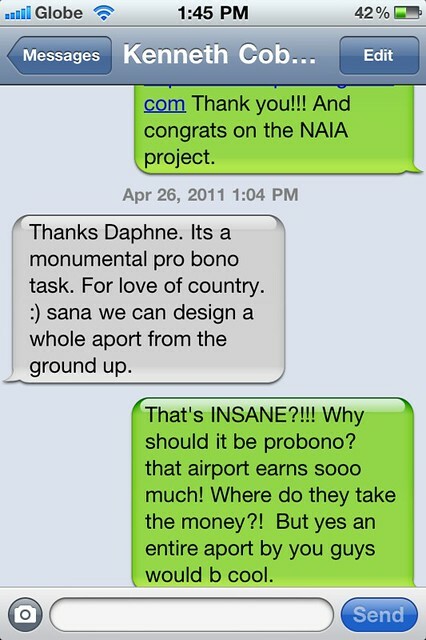 NAIA must earn gazillions per day! 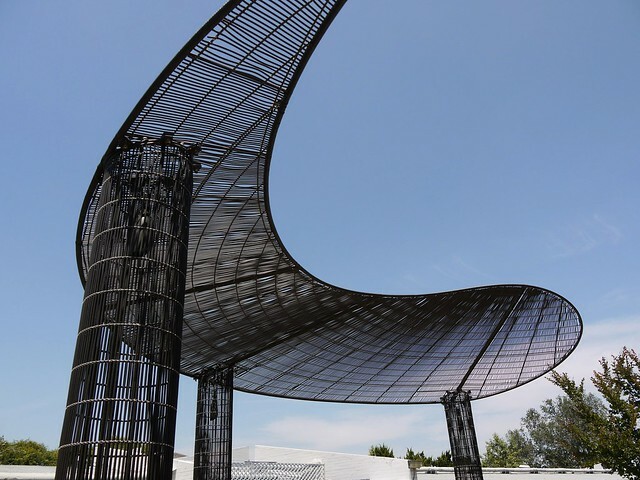 Moving on to design news, here is Kenneth’s public sculpture in MPTF in Hollywood. 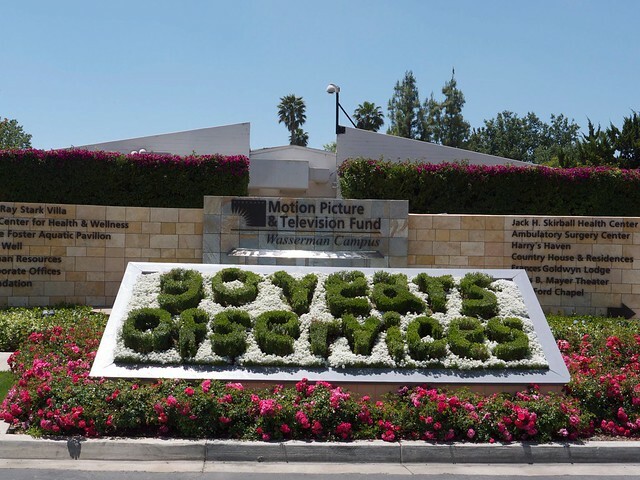 residents of the MPTF, while providing a fitting legacy to the Coburns. the outdoors and Jim’s spirituality and affinity for Eastern traditions. 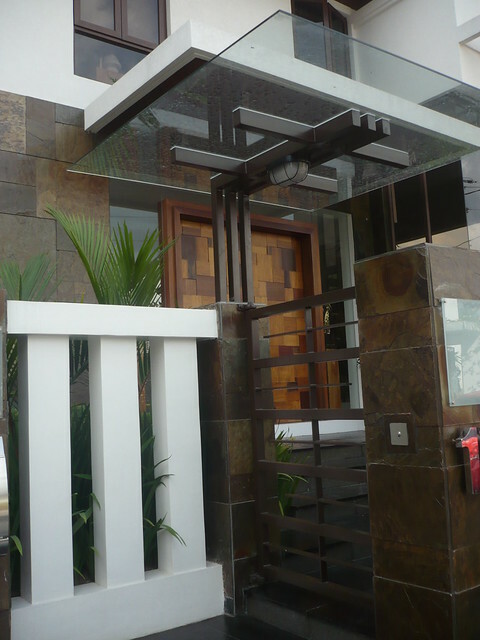 Made of galvanized steel, nylon and polyethylene. All photos, from Kenneth Cobonpue’s private facebook account with permission. 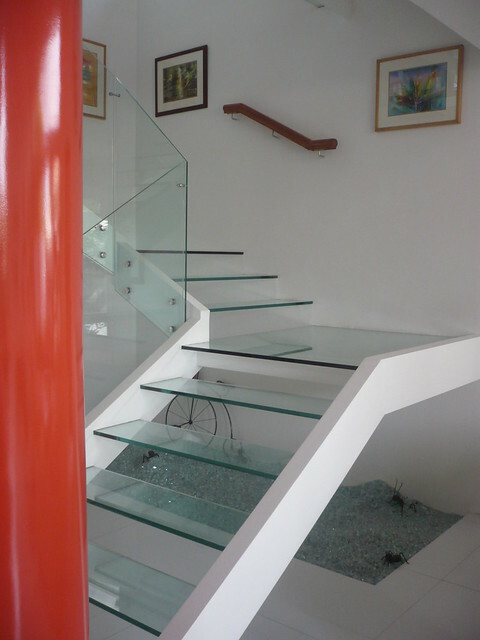 Last Sunday May 29, we showed a stunning house with a three-storey all-glass staircase. It warranted a lot of reactions from everyone — from awe to disbelief to ridiculous thoughts. 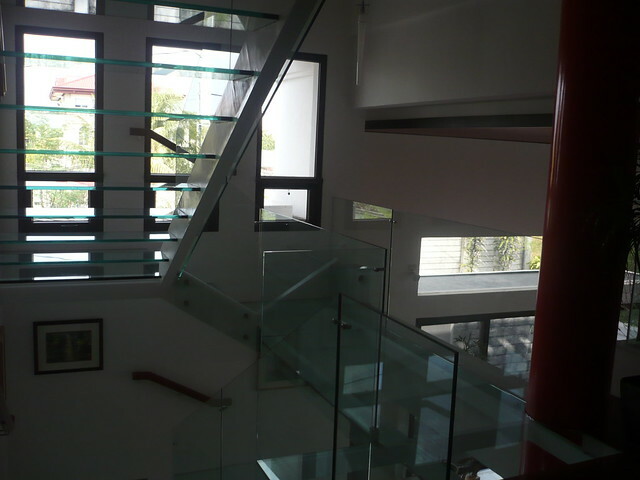 Yes, the entire staircase is made of glass from the first floor to the third floor. 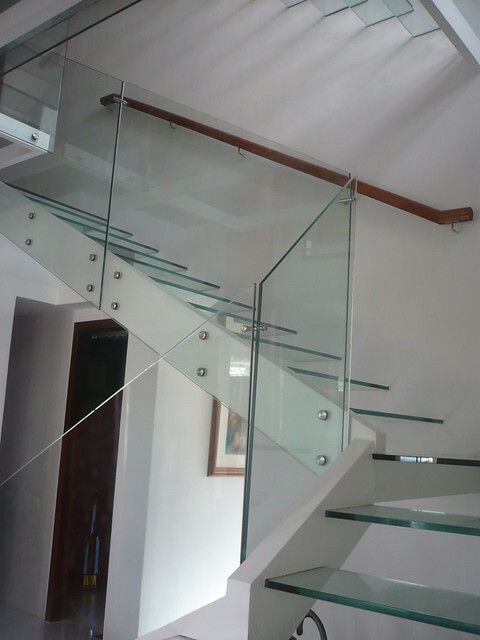 The architect and engineers used tempered glass. Yes, the owners considered the risks and possible inconvenience of seeing up someone’s skirt. But really, it’s a house not a hotel lobby. So I doubt guests would need to go upstairs to the bedrooms. And even if they did, all they have to do is ask everyone not to look up if they’re wearing a skirt. 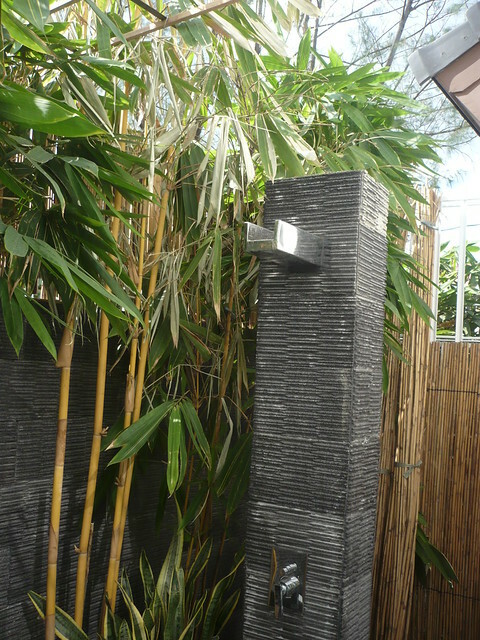 They also have an outdoor shower at the guest’s powder room. And lots of Michael Cacnio scupltures. Here’s an adorable one with the fibre glass balloons. 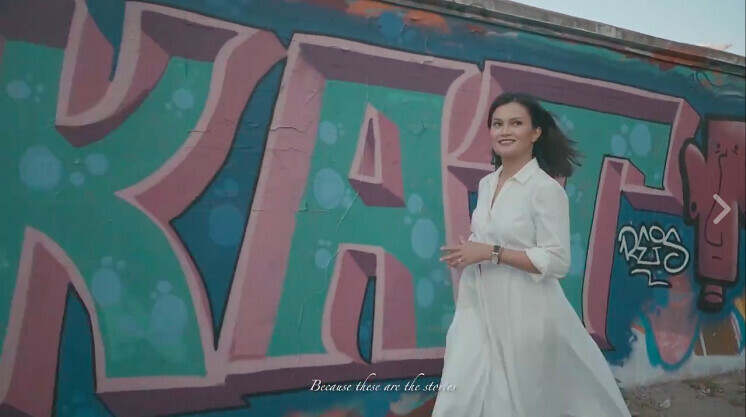 The architect and designer is Liza Acedillo-Bautista. 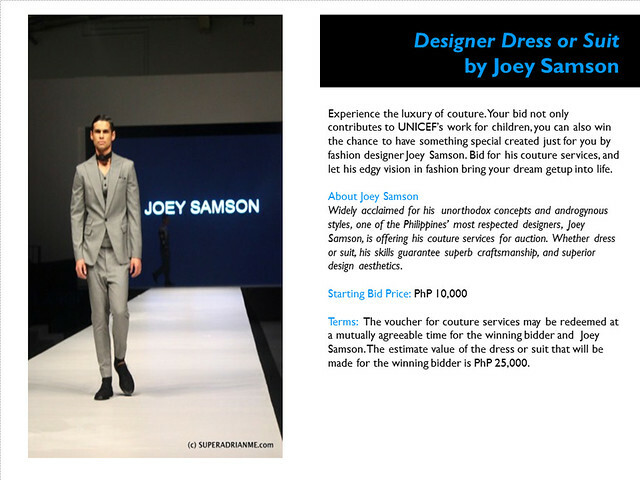 Get a chance to have a custom-made dress or suit by Joey Samson by joining UNICEF’s Auction for Action at www.ebay.ph/unicef. Click on this catalog page and it’ll lead you to the bidding. Joey is one of my favourite designers. He’s made for me some of the most interesting dresses. We first met at a Swarovski event – he was tasked to dress me up. He made me wear pants and some type of barong top. It was not very me at all. I was always into feminine, classic, pretty dresses. But I loved his work from that moment on. Joey has always given me a different perspective of fashion. I like the world of pretty and softness. But he’s the only one who can make me wear architectural and ironic. Here are some from my photo library. 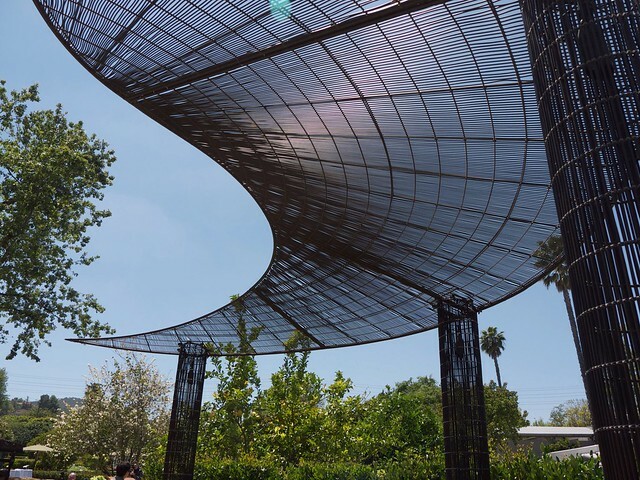 This looks simple but it’s actually gravity defying. There’s only one hook that’s holding up the top of this dress. This is’t actually a gown. It comes in two pieces – a strapless top that’s completely opened at the back (but covered in drapes) and huge flowing pants below. He made me a strapless column gown with cuts and patches that are almost invisible, but they added to the shape and sculptural quality of the bodice. Then he added this silk sheath on top to soften the look. Even this sheath had twists, patches and stitches. It was complicated. But the result was beautifully minimalist. This was a satin trench coat dress. I wore it to the launch of Mrs. Marcos’ jewelry collection. Here’s Joey showing me the drama of this jersey dress. 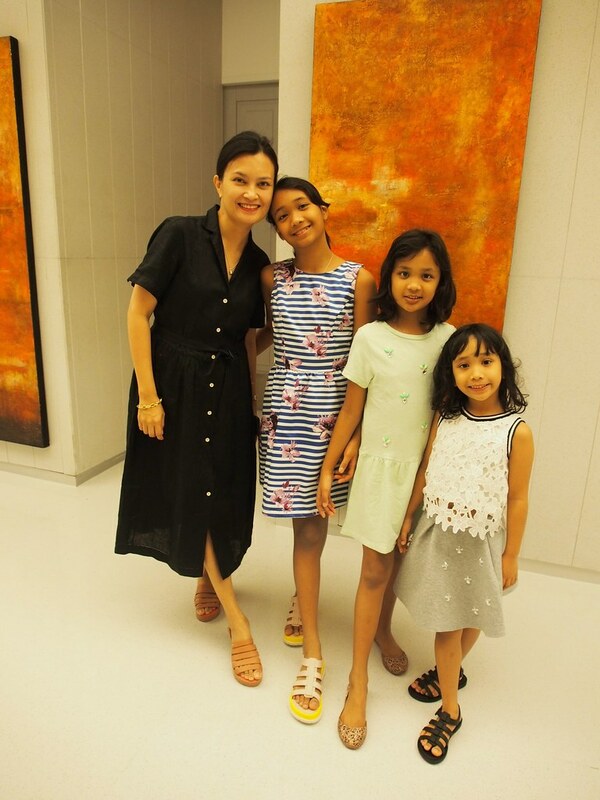 I wore this weeks after I gave birth to Lily, during the first launch of Olay in the country, 2006. One of my biggest dresses. It’s even bigger than my wedding gown. Joey made me this ball gown for the second Olay ball in 2007. A little trivia. I wore the Joey Samson ballgown in this Star Cinema movie photoshoot. I was cast as the sister of John Lloyd Cruz in A Very Special Love. But I never got to actually shoot anything. If you want to know the dirt, here it is. I even lent my other Joey Samson gown to the other female actress Bing Pimentel, and interestingly they placed a brooch in the neckline, LOL. Side story, everyone seemed surprised that I’d lend a gown to another actress. Truth is I overheard the production people say that my ball gown was too dressy compared to the other actress’ cocktail dress so they wanted to dress me down by putting me in a short wig. I almost fainted upon overhearing that. No wigs for me, not for a “role.” So I offered to dress her up in my gown. Note that I don’t lend clothes to anyone, not even my friends. But the situation called for it. And that’s all I’m going to say about that. Haha. One of my recent Joey Samson dresses. The same outfit from behind. The skirt is almost transparent. It is, actually. But because he plazed a gazillion yards of tulle fabric, it’s become opaque. Genius. The caged terno he made for me at the P&G 75th anniversary gala. There are a other amazing creations on auction – please check them out. We’ve opened the bids up to June 4. We’ve also got sculptures and paintings from award winning artists – a marble sculpture by Seb Chua, photograph by Tom Epperson, a hat by Mich Dulce and many more. Click this logo to take you to the auction. 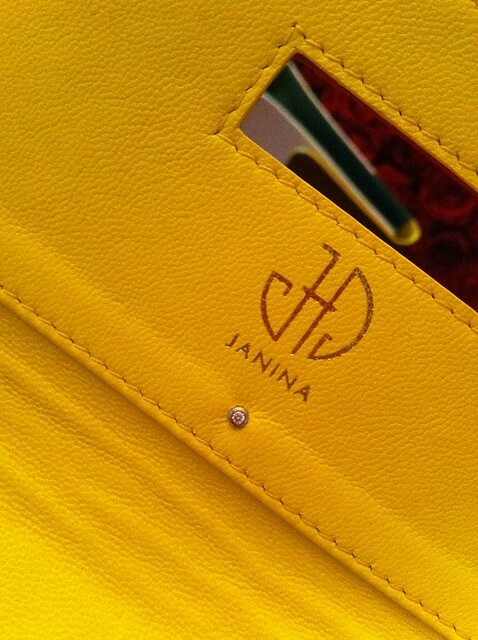 Last Thursday I attended the launch of jeweller Janina Dizon’s new bag line called Tatjana. I had a dilemma. It was a mommy & daughters’ day. I took my two older girls to watch Kung Fu Panda 2 (which we loved, by the way. Lots of sensitive issues. It was really sweet.) But I also didn’t want to miss Jenny’s bags. So I asked if I could bring my two rabbits. I was hoping her kids would be there too. 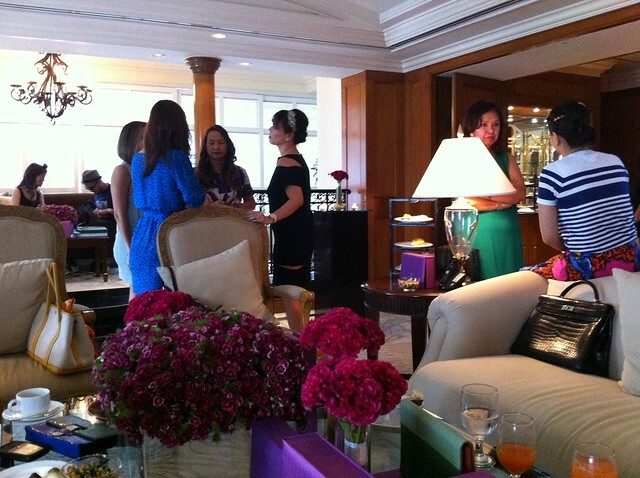 Jenny’s event was at the Presidential Suite of the Peninsula Manila. Gorgeous space. We felt like little princesses at a private tea party. Jenny asked everyone to wear hats or fascinators. But I pretended I didn’t get the memo. Haha. All the ladies looked so lovely. I constantly think of ways for my collection to evolve and it was a natural progression to introduce a handbag line. 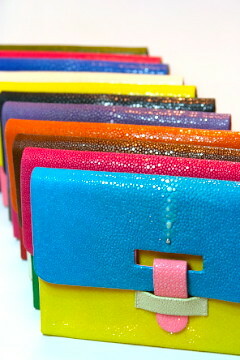 I am very excited to present to you my newest line, color blocked stingray clutches called the Tatjana. placed either inside or outside the flap. The yummy hues come in sunny yellow, grass green, blue sapphires, hot pinks and many many more. Bespoke orders allow clients to choose their desired skins, (stingray, alligator, python or water snake) color combinations and diamond placements. The stingray clutches were laid out beautifully across the tables. Major eye candy. 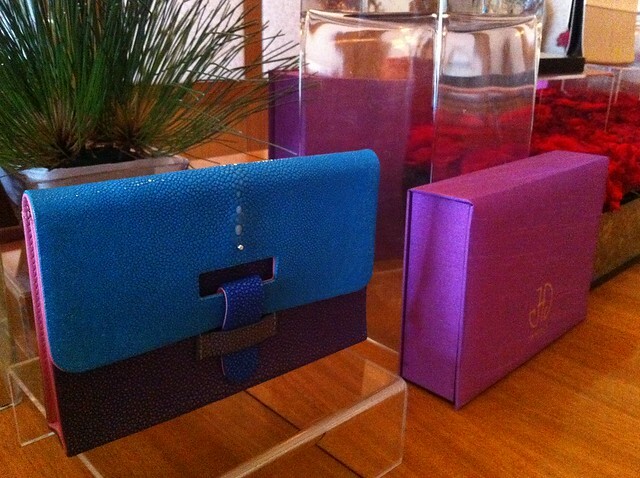 Each clutch comes with a 0.33 carat diamond – either inside or outside the flap. It’s a nice size for going out. It can fit a phone and a camera. Comes in a myriad of colours. 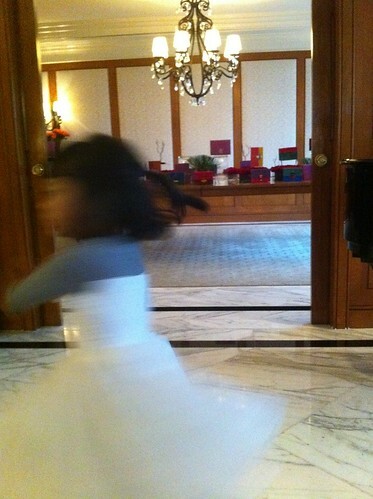 Lily couldn’t help but twirl and dance. Me and my girls. 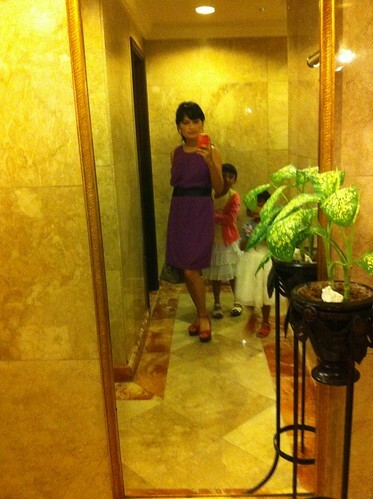 I wore a purple K&Company dress from their current collection. 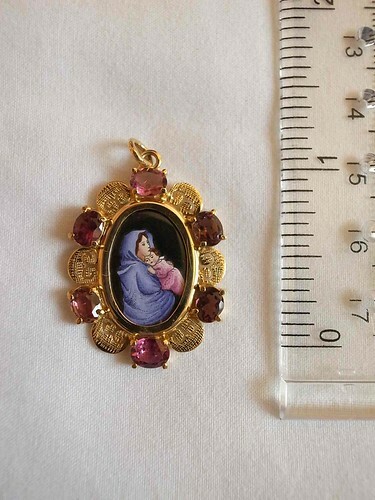 Hand-painted enamel pendant framed in 14 karat gold and pink tourmalines. Now at UNICEF’s Auction for Action for the benefit of children’s programs. Check it out here. This pendant is in the UNICEF Auction for Action lot. It is a special one because it depicts a tender hug of a mother and baby. I don’t think I have to explain that part. You, my readers, know me. Instead, please allow me to tell the story of the pendants and how they happened to me. At the early part of our marriage, Patrick gave me five antique hand-painted medallions. They came from the collection of his mother. I loved them first because of the technique and craft that went into painting miniature works of art. Those antique medallions came from Europe and became popular in the Philippines around the early 1900’s. They were so rare and delicate, but I hung them all together as a charm necklace. I wore them in F regularly and I got a lot of emails asking where I bought my necklace. Then on the second-to-the-last show on February 2006 (before F was taken off the air), I decided to share the story of the pendants. Emails and orders poured in. I couldn’t keep up. Then and even now, I have more inquiries and orders than I do have pendants. I couldn’t and still can’t meet the demand for my one of a kind necklaces. I don’t work with an assistant. Back then, I’d acquire antique medallions and rework them. That was impossible to continue as I didn’t have the time for antique-hunting. But I suppose this was meant to be… for me. I met an artist in Europe whose family specialized in miniature paintings like this. He currently runs his workshop creating these types of medallions. So these ones I now collect are all new – not antiques. Once I get the medals I work on the design of the frames – which are influenced by Philippine antique jewelry. My first feature about the necklaces was in Metro Magazine April 2006. I continued to wear them in my old show in ANC every Sunday evening. I was pregnant with Lily here. Preview included my necklaces in this editorial with Carmina Villaroel in October 2006. I loved them so much, I made shadow boxes for my personal collection. I’d hang them in the box whenever they were not in use so I’d see them all the time. Some of my pendants are available for sale in Accessory Lab. Some. Very few. Most people who inquire and order have to wait many weeks, some even months. I think my previous clients can attest to that. I am very grateful for their patience. So this one pendant at the UNICEF Auction for Action is really special. I hope those who’ve been waiting for me to get my act together would consider bidding on the piece. Just to show you, I still wear my medals up to now. I wear them all the time – either in dressy or everyday occasions. This is the cover story for 100 Magazine last April 2010. 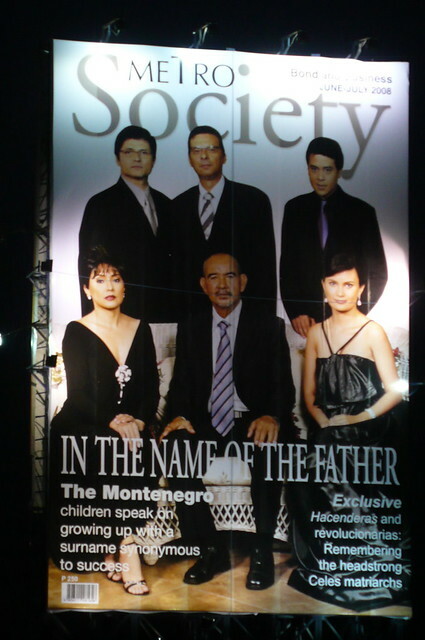 Cover of a Cebu weekend newspaper. I was unstyled. I like piling on my beaded necklaces and layering them with my pendants. I also have miniatures. This one actually belongs to my daughter Sophia. I’m putting together miniature charms for my three girls. But not all in one go. Mama cannot afford it. Haha. Besides they know how valuable these little paintings are. So they know that they only get one charm every milestone birthday or event. Soph’s next pendant, she’ll receive at her first holy communion. Like I said, I wear them piled on. 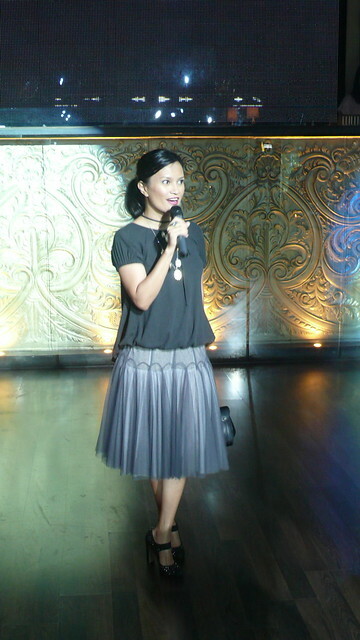 This was taken at a Rustan’s event. This is what it looks like casually. I was the featured guest in Balikbayan, Drew Arellano’s show in GMA/QTV. 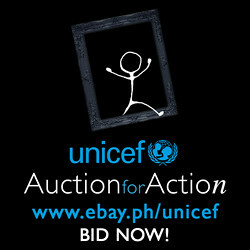 Please continue to watch the bidding online at www.ebay.ph/unicef. Click on the logo below and it’ll take you there. The jewelry and paintings are quite popular with the bidders. 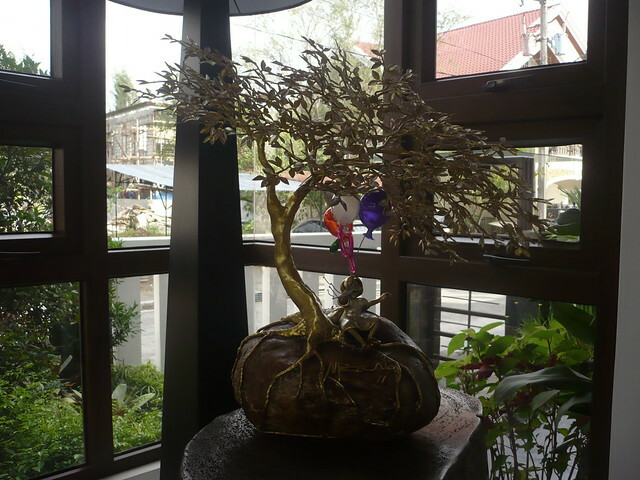 The sculptures and furniture are doing well with collectors. 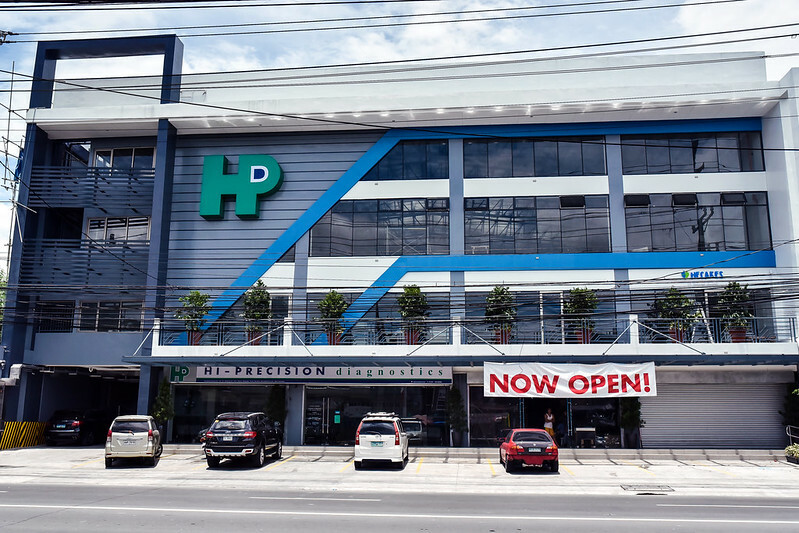 We also have experience packages like a glamour photo shoot with Doc Marlon, custommade suit or gown by Joey Samson, dinner for 4 at Antonio’s and access to the dugout of the Azkals during playoffs. 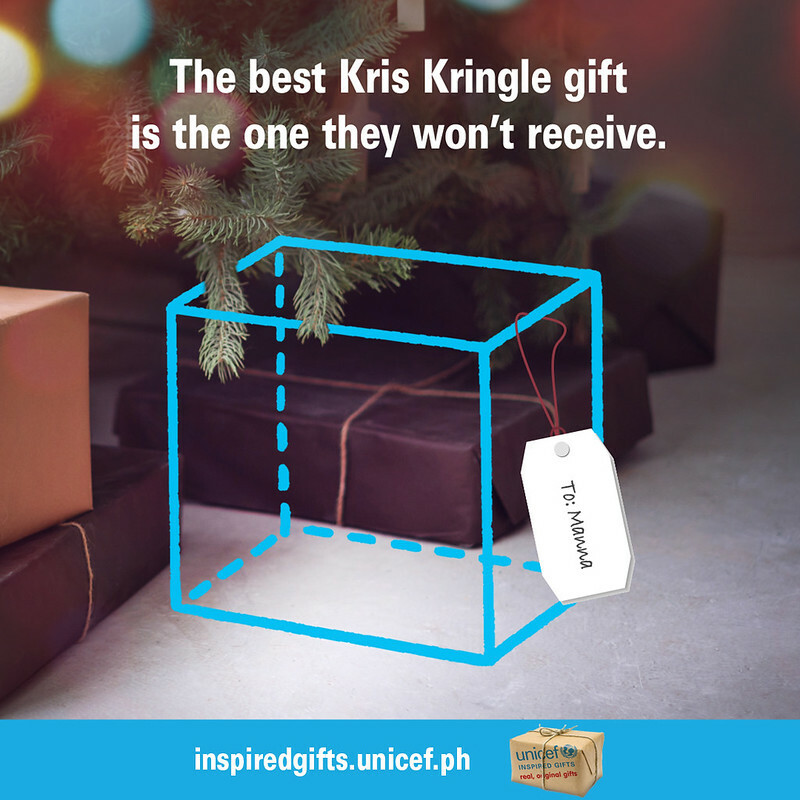 Click on this logo to check UNICEF’s Auction for Action.